An exhibition of artist Roberto Matta (1911 – 2002) will take place in the White Hall of the General Staff Building in St. Petersburg from April 2 to June 30, 2019. This is the first time Russia will see the works of one of the last Surrealists, virtually unknown to the local audience. Roberto Antonio Sebastian Matta Echaurren was born in 1911 in Santiago, Chile. He was of mixed Spanish, Basque and French origin. A cosmopolitan artist, Matta lived and worked in South America, France, Mexico, the US, Italy, Spain and England. 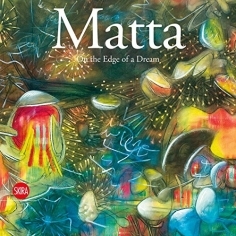 Urged by his parents who did not believe painting could be a serious enough occupation, Matta received a degree in Architecture at Catholic University in Santiago. While in the employ of Le Corbusier in Paris in the 1930s, he met the Surrealists and worked on his drawing. Andre Breton, who supported the young artist in his quest, wrote that "Matta had a unique way of showing the necessity to visually depict the four-dimensional universe. In his works, nothing is intentional anymore, everything comes from the desire to submerge into the area of the divine". Courage, thirst for knowledge, being open to new trends in art, deep psychological insight and keen interest in technical progress made Roberto Matta an outstanding figure in the world of art. That said, he never decisively joined any trend in painting: experimenting on the edge of art and science, he never became a "complete" Surrealist. His drive to rework Renaissance perspective with the help of the subconscious and the irrational distanced him from Abstract Expressionism as well. Rejecting the formal boundaries of style, Roberto Matta always checked his art with reality, trying to learn the depths of a human nature. Refusing to call himself an artist, Matta would say: "I'm not an artist. I'm somebody who tries to construct images that will once help us realize the essence of the verb 'to see'." Affected by the ideas of non-Euclidian geometry, Matta tried to give shape to the structures built in his mind, to create space beyond the visible, conventional perspective. After taking part in the International Surrealist Exhibition of 1938, largely thanks to his friendship with the English painter Gordon Onslow Ford, Matta started researching what he called "psychological morphologies." Ford introduced him to the works of Peter D. Ouspensky, a Russian philosopher and a theorist of the "fourth dimension." Matta shared Ouspensky's idea that the fourth dimension adds to the third dimension the feeling of space, of motion and of time that is essential for one to realize the constant and irreversible process of change in the world, where every new moment is different from the previous one. Ouspensky wrote in his book Tertium Organum (1912) that the human mind subconsciously "corrects" what the eye sees, in order to make up for the limitations of human vision. For example, mental concepts help us perceive volumes, though we only can see the outward surfaces of objects. According to Ouspensky, it is the artist who takes on the special role of a guide and a visionary, who "has to see what others cannot see" and "has to have the gift to open the others' eyes to what they cannot see themselves." In order to clarify his point, Ouspensky would often draw geometric lines, planes, cubes and spheres as metaphorical explanation of the human psyche. Matta took the latter's usage of geometry to describe unseen structures. Overcoming the limitations of human vision, he strived to create art that "can see more and further." Like many other artists, Roberto Matta moved to the United States after the start of the WWII. At about the same time, he started painting in oil. He arrived in New York in 1939, and his first US exhibition took place the next year at Julian Levy's gallery. Over time, Matta became interested in murals. 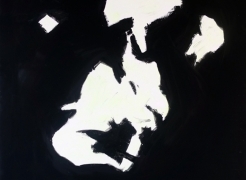 His giant five-meter canvases – "landscapes of mind" – had a great impact on the younger generation of American artists, among them Jackson Pollock, Arshile Gorky and Robert Motherwell. Matta experimented a lot with materials; he created textured reliefs, and a series of works with fluorescent paint. He was among the first artists to utilize the principles of biomorphism, depicting creatures of nature as elements of functional technical devices. The State Hermitage exhibition will feature over 60 works showing Roberto Matta's unique understanding of space and the evolution of the artist who was able to find his own vison of the world through the fourth dimension and project it on canvas. The exhibition will be organized and curated by Salamatina Gallery and overseen by Dmitry Ozerkov, Ph.D., chief of the Contemporary Art department of the State Hermitage Museum. The exhibition "Roberto Matta and the Fourth Dimension" is prepared by the Contemporary Art department of the State Hermitage as part of the "Hermitage 20/21" project, whose purpose is to collect, exhibit and study the art of the 20th and the 21st centuries.